Joan Eardley is now generally recognised as one of the most significant Scottish, and indeed major British artists of this century. She came from Blackheath to Glasgow with her family in 1939 and studied at Glasgow School of Art under Hugh Adam Crawford, who quickly observed her exceptional talent. After completing her diploma course her work was shown in Glasgow's Cosmo Cinema. 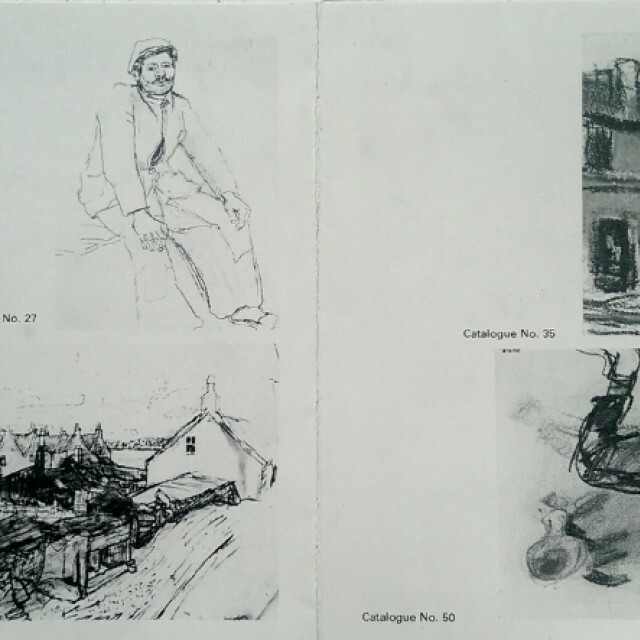 She worked as a joiner's labourer and for several years she visited Arran with her friend and fellow artist Margot Sandeman, and did many drawings there. She attended Hospitalfield Post Graduate Art School in Arbroath under the artist James Cowie, and there met Angus Neil, who later appeared in a number of important paintings. In 1947 Eardley returned to Glasgow School of Art to do the Post Diploma course awarded to her 4 years previously. Two Travelling Scholarships then took her to France and Italy for 8 months, where many powerful studies of peasants were done. On her return to Glasgow her scholarship work was shown in the Art School. She set up a studio in Cochrane Street, in central Glasgow, and later in Townhead district. From there she did the pastels and paintings of local children and street life for which she became noted. Around 1950 Eardley discovered the tiny fishing village of Catterline, near Stonehaven on the north east coast. She created a studio in a cottage perched above the North Sea, and began painting what are regarded as her finest works - the wild seascapes and clifftop landscapes of the North East. Frequently painting in the open air in the face of fierce winds and driving rain added great power and realism to these works. Her time was then divided between Catterline and Glasgow, where she continued to paint the children, including her favourite Samson family, and tenements, docksides and shipyards in Clydebank and Greenock. She had several solo exhibitions in Edinburgh and London and took part in important group shows such as 6 Young Painters at Parson's, London (1954), Aspects of Contemporary Scottish Painting, South London Art Gallery (1955), Gillies and Eardley, Edinburgh Festival, Scottish Gallery (1958), and Contemporary British Landscapes Arts Council Tour (1961). But her health had begun to decline in 1962, and in 1963, the year she was elected RSA, she died aged 42. After her death the Scottish Arts Council mounted a large Memorial Exhibition in Kelvingrove Gallery, Glasgow and the RSA, Edinburgh. Her work has steadily gained ever wider recognition. It has been featured in articles, books, films and radio, and is represented in many of the most important private and public art collections.